I had just crossed the stage of my 8th grade graduation with the rest of my class when my mom passed out in the bleachers of the gym. The heat is what triggered her first MS relapse and for the next 15 years or more we would watch this disease take her on a wild roller coaster of relapses. Relapsing Remitting MS is not kind, no form of MS really is. I look back at everything my mom endured while fighting this disease and am awe struck with her ability to keep our lives completely normal. The fight is real. It”s every day real. There”s no time to give up, no time to let this MonSter win. My mom is now secondary progressive and while that may sound like a good thing it really isn’t. My mom doesn’t have the number or severity of relapses she had before, her MS is just doing it”s thing a little bit quieter that”s all. Quieter? When a person with MS has a relapse any one or more of their symptoms is magnified greatly. With secondary progressive MS the disease is still progressing but the relapses, if any, are much calmer for lack of a better word. When my mom has a relapse these days she has to wait a few days to determine if it could even be one. Before it was so obvious she didn’t have to say anything. Scoliosis, drop foot and optic neuritis are a few things my mom has dealt with in the past 10 years. They certainly aren’t little things. A titanium rod keeps my mom”s vital organs from being crushed due to the muscle spasms she has thanks to MS. Those spasms took it”s toll on her spine and not only curved her spine but also twisted it and it happened within a year. Drop foot is weakness in the foot which then does not allow a person to be able to lift the front of their foot up and therefore tripping over things is greater. My mom has broken her wrist and both of her knee caps because of it. And then we get to optic neuritis. This is her newest challenge. MS has damaged her optic nerve and, as of today, has effected her color vision. Will it get worse? We pray it doesn’t. Will it get better? No it won’t. For almost 30 years I’ve watch this disease and what it has done to my mom and many others we know. Since 2014, the first year I was a relay runner, I have met many warriors fighting this disease. I’ve been one of the first to find out their diagnosis and I’ve been one of the only they have told. I’ve been hugged and prayed for, thanked and cried with. They aren’t giving up and neither will I. I run farther to help those with MS.
Five years into the relay and I don”t see myself stopping. The training is hard but the fundraising is definitely harder. I cannot even begin to thank all of you for your remarkable support over the years. 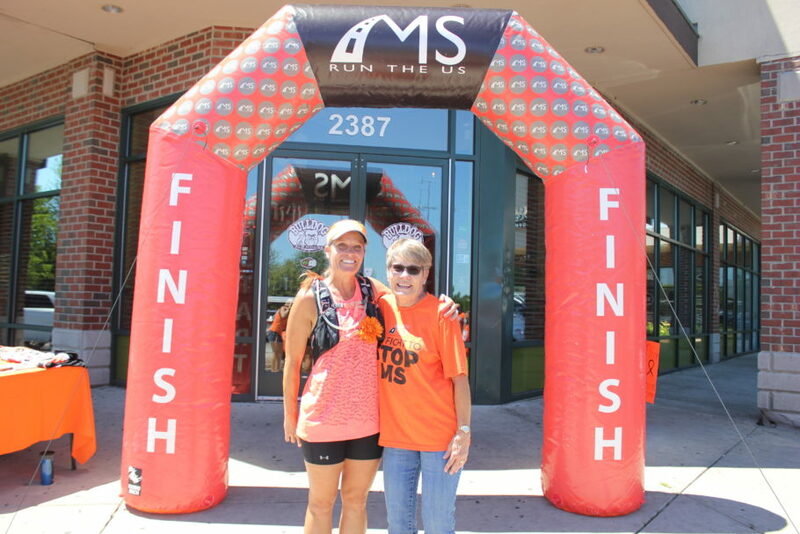 It is only because of you that I am able to raise almost $10K every year to help those with MS. You all also keep me going during my week of running. I’ve had many obstacles during Segment 13 over the years but I have never given up. Those two words are not in my vocabulary. This year, as you can see, my segment has changed locations. Still Segment 13, still the beginning of July when Dante”s Inferno always shows up, but for 2019 I will be running from Dubuque, IA to Milwaukee, WI. I am honored to be running through Wisconsin because this is where the relay originated from. I am also thrilled and honored to be running this segment with relay alum Katie Kline who ran last year in memory of her mom. This pairing of runners was meant to be! $25.00 Support one of the 250 people I run for!